A rendering of the entrance and lobby area of ‘Bailey’, part of the Crystalbrook Collection. In preparation for the first of three grand resort openings in Cairns this coming November, luxury hotel brand Crystalbrook Collection is on the hunt for as many as 500 talented people to help it fill a variety of operational vacancies at its three new properties. Crystalbrook is looking to fill positions including ‘Lobby Ambassadors’, ‘Experience Curators’, ‘Food & Drink Guides’ and ‘The Fix-It Team’ among other departments and is inviting people from all walks of life and all experience levels to be considered. Over 150 of these roles will be filled in the next three months ahead of its first launch. For locals in the Cairns region, the expanding luxury resort chain is inviting all interested parties to head to 137 The Esplanade, Cairns at 10am on Saturday 18 August to learn more about the positions vacant and meet with management. For those unable to attend in person, the resort group is inviting CV’s to be lodged online at crystalbrookcollection.com/become-a-collaborator. Crystalbook Collection CEO Mark Davie said it was exciting that the group was growing to the point where it had such a menagerie of jobs needing filling. “Our environment is dynamic and entrepreneurial, and we heartily believe in looking after our people,” added Group Director HR and Operations, Laura Davie. A rendering of one of the upcoming ‘Flynn’ hotel rooms. 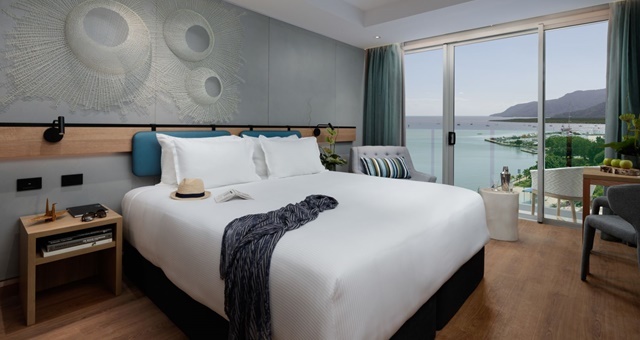 Crystalbrook Collection will debut ‘Riley’, a collection of 311 rooms and suites in central Cairns overlooking either the city, the resort pool or the Coral Sea. Overseen by General Manager Joel Gordon, the flagship room will be the aptly-named ‘Riley’s Suite’, a two-bedroom residence offering two bathrooms and three balconies, capable of sleeping six. Riley will also offer the Eléme Spa and three restaurants in the Mediterranean-inspired ‘Rocco’, wholefoods market ‘Greenfields’ and ‘Paper Crane’, which will serve delicacies from SE Asia. A little over a kilometre down the road and next on Crystalbrook’s opening schedule will be ‘Bailey’, a property which appears more hotel style yet more contemporarily artistic and modern than Riley. It will offer 217 rooms, each loaded with features including free wi-fi, Nespresso machine and rainforest shower. Dining options at Bailey will include modern Australian at ‘CC’s Bar & Grill’, Aussie classic beverages at ‘Milk Bar’ and Mexican fare at ‘Colada’. Positioned close to Cairns’ Reef Hotel Casino, Bailey will also offer a cosy event space capable of hosting up to 150 people. 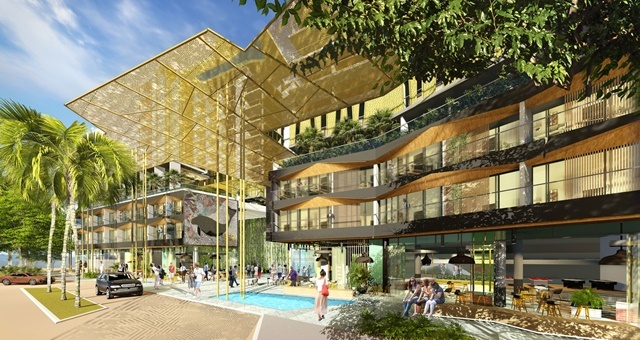 Occupying space on the same block as Bailey will be Crystalbrook’s third property, known as ‘Flynn’, which is being billed as a vibrant and energetic hotspot. Like Riley, Flynn will offer 311 rooms and a namesake restaurant serving traditional Italian. Other dining options will include a gourmet street-food market in ‘Boardwalk Social’ which will feature stalls serving grilled meats, chicken, fish, pizza, gourmet desserts and juices in a communal environment. Flynn will also offer a high-end bar known as ‘Whisky & Wine’, which will showcase boutique Australian brewers and distillers while also offering high-tea and share plates. After Riley’s opening in November, Bailey is due to launch in mid-2019 while Flynn has been slated to follow late next year.